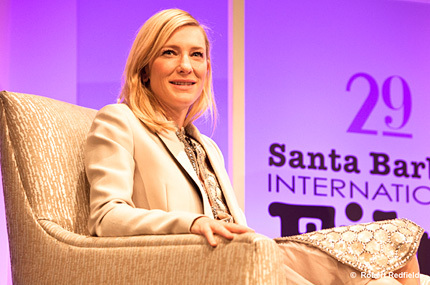 When I asked SBIFF Executive Director Roger Durling, "Why Cate on a Saturday night?" 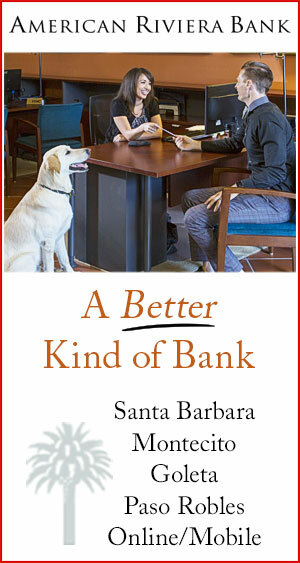 his eyes lit up with playful incredulity, as though there was any other option. "Because she is Cate. Because she is the best actress and she is going to win the Oscar." As though there was ever a doubt. 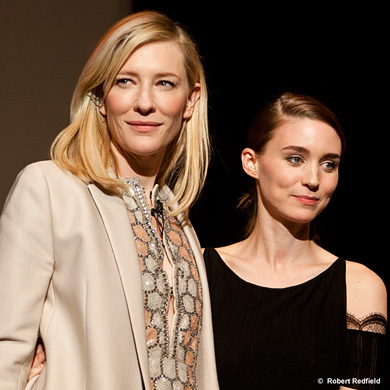 It is this same fierce spirit of expected confidence that gathered a sold-out house on Saturday night at the Arlington for Cate Blanchett's Outstanding Performance of the Year Award for her recent role in Blue Jasmine. Yet the audience, in eager expectation of a Hollywood star, got way more than they bargained for in a two-hour interview conducted by film critic Pete Hammond. An interview that, by American standards, reset the bar of what Hollywood represents. On the surface level, there are many gems about Cate Blanchett that keeps us hooked. Perhaps it is her rich Australian accent or the fierceness of her blue eyes. The way she glamorously wears bejeweled cream couture on cream couture. We expect this from Hollywood. When signing up for entertainment on a Saturday night, we anticipate glitz and performance. What we don't expect is exquisite poise that wouldn't care if you noticed, but trusts it would be your loss if you didn't. We expect Hollywood to woo us, but Cate's draw comes in the unexpected, the way she calmly rests her hand on her face, as her own impotently brilliant film reels play on the screen beside her, only for her whispers of, "I'm not a big believer in regret until I see those." And continues throwing the audience off guard for the next few hours. As viewers, we expect to hear discourse on how actors connect with difficult characters, but we don't expect vulnerable responses. 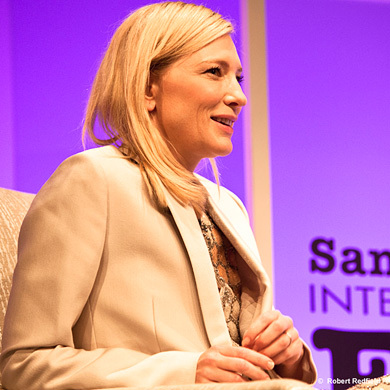 We get delightfully disoriented by Cate, when asked if she's ever felt insecure about her ability for a role, responds, "All the time. Insecurity is integral; if you know how to do something and can securely imagine the outcome, then the process becomes increasingly arid, and there is no adventure and no risk." 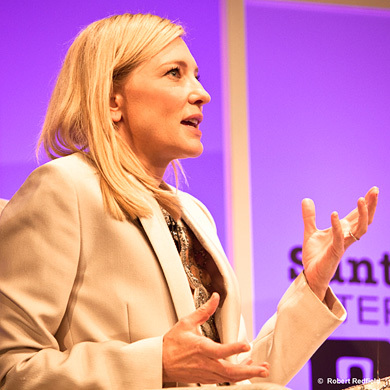 We expect actors to be moderately clever, but we don't expect philosophy on how to live our days, as Cate, who has conquered roles from Kathryn Hepburn to Bob Dylan, gives advice on personal vulnerability. "No one great stands on the edge and jumps with a net," she says. "You have to risk exposure every night until your process becomes alive." We expect actors to be self-centered as we fawn over them, but we don't expect their attention to be as equally focused on us, with Cate's remark, "A performance is only as good as the gaze you are looking into." We expect actors to feel a level of arrival, not a Saturday eve stated mantra of, "You keep working to rectify past mistakes." We expect actors to revel in their own confidence, but we don't expect the confidence that delivers unscripted lines on the unknown , stating, "You must embrace the fact that things may not work and you will be in uncharted waters... in ways you thought not possible and it's always terrifying." We expect actors to talk on the distinction between fantasy and reality in film, but we don't expect a response of, "What's a real character anyway? They are all inventions and harnessed and anything you can do to maintain your curiosity is pivotal." Simply, a Saturday night with Cate reminds us that we, as audience members, have lowered our expectations. We don't expect Hollywood to deliver honesty, disclosure, vulnerability, the expressed impetus for brilliant community, and a call to higher gratitude. We expect to be star-struck, but we don't expect to be challenged to live our own days, in the movies of our own mundane lives, in ways of exquisite risk. At least not on a Saturday night. But that is what Cate delivered from her graceful seat on stage right and this is what the fortunate audience of the award ceremony received - two for the price of one. For Cate whose recent performance in Blue Jasmine will likely bring her the Oscar, her work is one that pushes the boundary of possibility. Throughout the evening, clips of Cate's prolific film history spun across the screen, presenting her in roles from gown-wearing Elizabeth to elvish Hobbitland, yet to listen to Cate is to hear insider scoop's on the spectacular directing behind such films. Because she has worked with the greatest directors of all times. She is the best because, in her description, she's collaborated with the greats and she, in her own words "wouldn't know how to do this thing called acting without them." This is why we love Cate Blanchett and choose to honor her. Because she beckons Hollywood to emerge from its superficial tendencies and begs for it to rise to the standard of articulation it was designed to possess. To listen to her interview reminds us why Hollywood began in the first place - as a pathway for viewers to get lost in a story with real heroes and heroines, and ultimately to return to our mundane lives believing that courage is readily available and within our own grasp. If we are willing to attend to the risk. To remind us all, as audience members, that outstanding performances - be they male or female - can exist in reality just as easily as it does in the fantasy of the silver screen. This balance between heroic fame and common skin, between strength and fragility, between finding the buoyancy amidst despair, is the crux of Cate's masterful performance in Blue Jasmine. But as this evening at the Arlington reminded, taking center stage is far more than reading a script. You simply can't act your way into this level of brilliance. Sitting under her prowess, the audience can't help but feel that they are a far cry from People magazine - in a good way - as Cate reminds of the austere responsibility of one's life work. She reminds us that strength in Hollywood does not have to be dominated by men, nor unintelligible characters, nor slapstick writing. She speaks intimately of Ron Howard's brilliance, commenting how "he would never ask you to do anything he wouldn't do himself," or how Peter Jackson is "the only person who can make you believe there is an army behind you." She is the best because, in her description, she's collaborated with the greats in a spirit of gratitude. Cate reminds of the communal nature of any work community, as "the role is the secondary part of the whole process; it's who you work with and the whole ensemble that creates the endeavor." 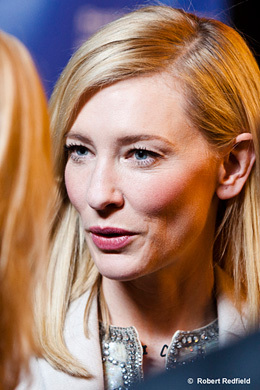 Blue Jasmine is her latest collaboration with Woody Allen, but what other Hollywood actor intertwines commentary on Mr. Allen with her own poetic discourse on human emotion, saying that, with Woody, "I'm laughing because I feel very uncomfortable or I'm laughing because that's an incredibly funny line or I'm laughing because I know I shouldn't be laughing, and there are many different kinds of laughter." Walking down the red carpet prior to her auspicious interview, I asked Cate, "What's really the secret to working with Woody Allen?" and she calmly replied, "You show up, do your job, and make the most of every opportunity you can." It sounds simple enough. But outstanding performances are never simple. And, in the next two hours, Cate provided us all with practical ways to live that reality out, insights on what it actually means to "show up" as Oscar performers of our own lives. Standing on the brim of the red carpet, I expected glitz, glamour, and gorgeous presence. 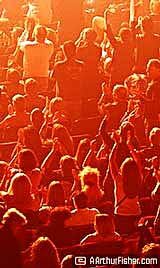 What I did not expect was to leave with insights into how to be greater in the world, how to reach out in connection in our community of ensembles, how to continue risking in whatever role in which we are assigned. Look out America. Because if there is any female heroine who can redeem Hollywood, it just might be Australia.